This week at Everybody Art Challenge we have an excellent sketch for you to follow. The design team have made some amazing projects for your inspiration, be sure to check them out. For my card I have made a Get Well Soon tent card using a cute image from Lily of the Valley. It was a dream to colour and came together very quickly using Copics. Here is a close up of the cute teddy. 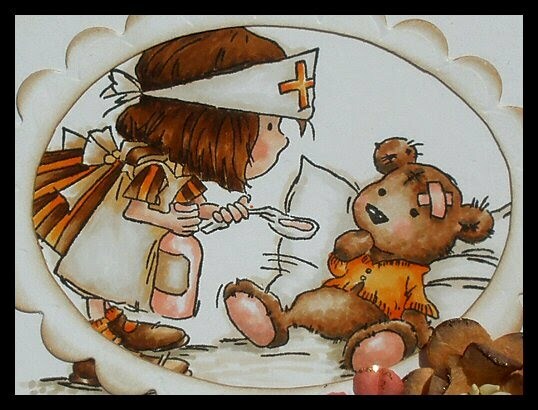 Materials used: Peach Bazzill card Paper - Bo Bunny - Kitchen Spice Image - LOTV - Little Nurse Copics - Teddy - E53, E31, E35, E37 , R000, R20, YR31, YR04, YR07 Nurse - W0, W1, W3, E53, YR31, YR04, YR07 Sentiment tags - Nestabilities, Personal Impressions Flowers - Wild Orchid & Prima Punch - Martha Stewart Finishing touches - Stitching, ribbon. Oh this is so sweet Jenny!! Totally gorgeous Jenny, love your sweet card! This card is SOOOOOOOOOOOO cute! I love it!